Does it take more than a minute to locate a favorite outfit in your closet? Do your freshly laundered or dry cleaned clothes come off the hanger in need of pressing? Do you wear the same clothes each week, even though you pride yourself on your updated wardrobe? If you answered "yes" to any of these questions, you could save time and rejuvenate your wardrobe with a closet clean up. 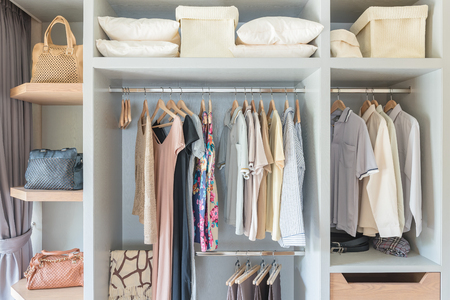 These tips for organizing your closet can help you get it all together. Start organizing your closet by removing all the clothes and accessories inside, and sorting them by type: shirts, pants, suits, dresses, coats, shoes, belts, and handbags. Store winter or summer garments until the appropriate season. Update old clothes by having them altered. Donate unwanted wardrobe items to charity. Sell expensive articles on consignment. Use soft, worn-out clothes as cleaning or car washing rags. Among the remaining garments, you'll probably find numerous wrinkled but wearable items that you haven't slipped on recently because you couldn't find them. Make a mental note to place these "aha!" items in plain view. Now is a good time to evaluate your past storage methods and consider how you can be more efficient. Have you spent far too much time searching for the right shirt to go with a favorite suit? Consider hanging the two pieces side by side. Are you a separates mix-and-matcher? Then group separates by color (so you can quickly scan for the day's color scheme) or by type of garment, placing blazers next to shirts and pants beside skirts. Decide whether it would be easier for you to view your clothes by type (work clothes and weekend wear), outfit, color, or length, and then arrange your closet accordingly. You can double your space by adding a second rod below shorter items such as shirts and folded-over trousers. Then hang more of the same there. Alternatively, you might consider adding shelves for your T-shirts, sweaters and shoes beneath hanging items. After all, when your clothing is buried inside dresser drawers, it's out of sight and less likely to be worn. What's more, hanging a knitted or lightweight garment on a hanger can distort the shape of the fabric, detracting from its appearance and requiring more frequent - and more time-consuming - pressing. What about those odds and ends that can clutter drawers and dresser tops? Hang a mesh laundry bag in your closet to keep socks, stockings, handkerchiefs, and other small items easy to find. Try looping belts over a hanger next to your pants, or hang them on hooks inside the door. You can store hats or bags this way as well. 5 Still More Stuff Than Room? If you still have more stuff than room, it's time to bring in reinforcements. There are plenty of inexpensive organizing tools that can help you maximize your wardrobe space. Over the door shoe organizers keep shoes off the floor and in plain sight. Also, there are plenty of racks for scarves, belts, hats, and other accessories that can save space in your closet. If the basic design of your closet simply isn't functional for your wardrobe or leaves you short a hanging rod or three, you have several simple options: You can buy a new or antique freestanding armoire or wardrobe. You can also purchase a custom closet organizer system kit and retool the space yourself.